Kolchak Tales: The Frankenstein Agenda issue #2 finds Carl into a very bad situation that story about sasquatch sightings he had originally been sent to cover has now turned into an encounter with something far more terrifying in appearance than your run of the mill bigfoot and in its gigantic hand it held a women who is screaming “Don’t hurt my son” at the top of her lungs. Yes this Sasquatch assignment had taken a turn for the weird that even Mr. Kolchak could of not seen coming in a million years. Now instead of looking into big foot sightings Kolchak would find himself helping out a frantic mother in the investigation of what happened to her son during a secret military experiment that turned him into a monstrous creature resembling a mixture of your common big foot description and Swamp Thing. Meanwhile the army is hunting down its creation in hopes of silencing the risk of the story getting out to the public as part of a massive cover up. In true classic 50s drive-in sci-fi fashion you are taken on a journey that will remind you of early cinema seen from the backseat of a car with your sweetheart next to you. I’m having a lot of fun with this Kolchak series and one of my favorite things about the franchise is the perfect blend between both classic horror and sci-fi feeling stories they come up with one after another. To me Kolchak is the perfect blend of all my favorite genres horror, crime, sci-fi, and at times comedy all brought together in a flawless manner. This is the reason I always return to the world of Kolchak and never walk away unsatisfied, I can honestly say that about few comic franchises which is why Kolchak is by far my favorite. The plot twist presented to the reader in this issue drives the story along at a nice pace and turns just another big foot story into something much more intriguing and original a feat that the writers behind the Kolchak series always seem to shine at in their always spot on displays of writing ability. 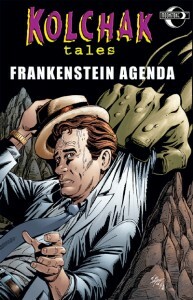 Kolchak Tales: The Frankenstein Agenda is shaping up to be yet another solid addition to the Kolchak universe and reason o return to the series that you have loved for all these years. Fans of old school sci-fi will find extra enjoyment in this one with its very retro feel and nod at classic sci-fi film and should go out of their way to experience The Frankenstein Agenda.